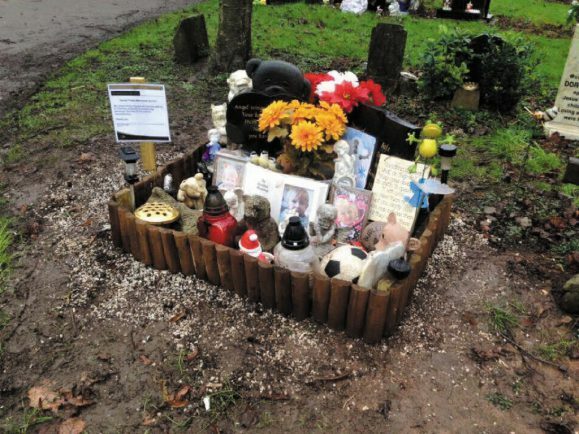 ‘IF IT weren’t for Council failures in the first place, there wouldn’t be the need for a memorial for Daniel Pelka at all’ – the damning words of one furious campaigner who has accused the council of ‘insensitive behaviour’ after tributes from the murdered school boy’s grave were removed from St Paul’s Cemetery in Holbrooks. Nicci Astin, of the Justice for Daniel Pelka group, said she is devastated after tokens of remembrance laid at the murdered youngster’s memorial stone were removed by Council staff and found dumped by a nearby bin. The stone, which was erected in 2013, had become a place for members of the public to remember the Holbrooks schoolboy. Daniel was systematically tortured, starved, beaten, forced to eat salt and locked in a freezing bedroom by his parents before he was killed by a massive, final blow to the head in March 2012. His death sparked a crisis in the Council’s children’s services department after a damning Ofsted report rated it’s child protection performance as ‘inadequate’. But decision by the council to move items has sparked anger among the group when a member found a toy car trampled into the mud and a small potted Christmas tree, adorned with personalised trinkets for Daniel, dumped next to a bin. Councillor Rachel Lancaster, cabinet member for public services, described the memorial as an important place for people to reflect on Daniel’s short life, but argued items had been removed after tributes had begun to ‘significantly encroach’ on a neighbouring grave. Apologising for any upset caused, Coun Lancaster added that confiscated items were being stored safely and would be returned to the Justice for Daniel group later this week. Ms Astin also denies claims the memorial was encroaching on other graves – arguing the land next to Daniel’s memorial stone had always been empty as roots under the ground prevent the Council from selling the plot. “I’ve offered to pay for the unoccupied land at the side of Daniel numerous times,” Nicci explained. “But the Council has always refused. “With the amount of interest in Daniel and the number of people that pay tribute to him, the Council should have expected the memorial to get bigger over time. “I’ve never had any compaints about the size or upkeep of his memorial. “What’s most upsetting is not the fact the Council have down-sized, it’s the fact they never contacted me. Andrew Walster, assistant director for green spaces at the council, argued they had not been ‘heartless’ but echoed Coun Lancaster’s apologies for upset caused. “Part of our job is to ensure we maintain the cemeteries for everyone. Mr Walster said Daniel’s Christmas tree had been moved next to the bin as it couldn’t be stored in a shed with the other confiscated items for fears it would die. He added: “I’m at a loss with the little car that campaigners claim had been left in the mud. “Our guys who did the work took a picture after undertaking the work which didn’t show the car on the ground. Mr Walster also accepted the Council had not informed the Justice for Daniel Pelka group prior to confiscating the items. He added: “Normally we would notify the plot owner. She added: “The Council has completely lost the group’s trust – I know items haven’t been kept safely, I know they failed to contact me despite having my contact details. “In taking away tributes, Daniel’s memorial looks like a plain plot, but this little boy deserves more than that. “In remembering Daniel, we remember never to let anything like this happen again.